My family is lucky because we have a frog pond behind our house. At this time of year, the frogs chirp very loudly every time there is rain or the temperature rises. 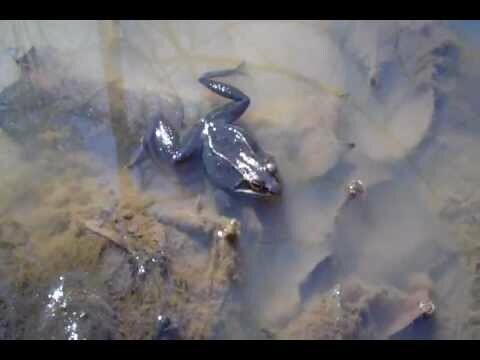 This year we have a bounty of frog eggs to observe. Show your kids that you are totally okay with them getting muddy. Have a mud mat and hose handy. Bring inexpensive nets and shovels. Have easy snacks pre-made by the door so they don’t have to go inside to eat. Write a specific goal for an outdoor place you want to explore with your children. And here’s a bonus tip if your kids are small and you need to stay handy. I bring a book or magazine to pass the time while I sit nearby. My husband brings his MP3 player and Sudoku. I’m trying to give them a true free hour without adults telling them how to play or how to learn, but I do want to keep them safe. So if I can keep my hands busy, I’m more likely to sit quietly and just let them do their thing. Hopefully this video inspires you to be okay with mud and let the kids get knee-deep in it. They are learning and celebrating life! Wildlife Watch – Get a customized list of wildlife for your area and report which wildlife you see. Nature Find – Find muddy places near you. Certify Your Yard for Wildlife – Invite frogs to your yard by gardening for wildlife.